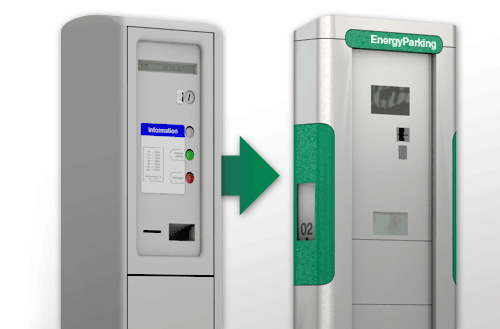 Operators can establish EnergyParking in a new facility or replace existing parking meters with the new system. In either case, no time-consuming work is required. The modular design of the master and satellite make EnergyParking the perfect choice for parking facilities large and small. The operator can also decide whether the use of the energy parking spots is to be reserved solely for hybrid automobiles and electric cars - and can enforce this decision. The system recognizes whether the vehicle being parked is an electric car or one with an internal combustion engine and informs the operator accordingly. Those who pull out all the stops now will fast-track to the future. Because once e-mobility really takes off, only those leading in know-how and technology will profit, while everyone else pays dearly in trying to catch up. Charging at the stations is easy using standard plugs: select the current, enter the time, pay, connect the charging cable, and you're done. Only the authorized user can remove the cable during and after the charging process and then disconnect from the charging station, eliminating misuse. To remove the cable, the user enters the code which is printed out at the beginning of the charging process at the master. As soon as the cable is disconnected from the charging station, the charging cover locks close automatically. Payment is just as customer-friendly: the user can pay for parking and current at the master either with coins, or cashless using a debit or credit card. The use of smart cards and customer cards is possible as well. When selecting current, the user is not bound to one or more energy providers. The operator decides which ones to integrate into his system – the user selects the provider and type of current. EnergyParking submits the free choice of current power generators. In the future, navigation systems and computers will show where the next open energy parking spot is available. Cooperation with competent partners ensures that future drivers of electric cars will always find the energy they are looking for.